A two-vehicle wreck in front of Marshall Medical Center South yesterday killed one, and left others uninjured. 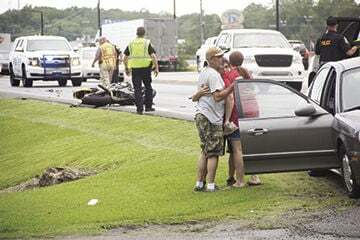 Boaz Police Chief Scott Farish said Zachary Lamar Smith, 25, of Gadsden, was killed when his motorcycle collided into the back of a gray Hyundai around 5 p.m. Wednesday afternoon. Boaz police currently do not know how fast Smith was driving at the time of the incident, but Farish said witnesses at the scene saw Smith driving erratically before the crash occurred. Farish said no other injuries were reported. Smith was a graduate of Crossville High School, and attended Snead State Community College. According to close friends and acquaintances, Smith worked at Alatrade in Albertville.